New research led by Daniel Howard, assistant professor of biological sciences, has revealed that a species of giant weta found only in New Zealand’s Cook Strait region communicate with each other by sending vibrations through materials in their natural environment, such as leaves, soil or plant stems. This is the first time these mouse-size insects (yes, you read that correctly), related distantly to North American crickets, were observed using this particular type of substrate-borne vibrational signaling, which isn’t perceptible to humans. "Understanding how animals have evolved to solve adaptive problems like communication provides us with insights into not only how nature works, but in this case how we might approach species conservation." The findings, which were recently published in the Journal of Insect Behavior, are significant in part because they have implications for conservation efforts directed toward this at-risk species. Weta, which means ‘god of ugly things’ in the indigenous Maori language, evolved in isolation for 80 million years in New Zealand. With no natural mammalian predators to hide or escape from, over the millennia the weta became lumbering, wingless and occasionally odiferous —in other words, very easy to detect and ensnare. And when rodents arrived on New Zealand about 800 years ago, they began to do just that, plunging most giant weta populations into steep decline. New Zealand’s government has designated 16 out of an estimated 83 species of the four main types of weta for protection – and of those 16, 11 are giant weta (genus Deinacrida). The research team, which included Carrie Hall, assistant professor of biological sciences at UNH, Ashley Schmidt from the University of South Dakota Sanford School of Medicine and Andrew Mason from the University of Toronto at Scarborough, observed that vibrational signaling was most often used by males trying to intimate or scare off a rival when both males were in the presence of a female they were attempting to court. The vibrational signaling is effective because it’s encoded with important information about the signal’s sender, including virility and combativeness. Typically, the males who initiated the substrate-borne communication won the confrontation and could proceed to woo the receptive female. Howard and Hall, along with UNH doctoral candidate Brooke Woelber and Sarah Dodgin ’18 are currently studying the Mahoenui giant weta at Warrenheip Reserve on the North Island of New Zealand. Undergraduate students enrolled in the UNH Ecoquest study abroad program helped reintroduce this population of endangered giant weta to Warrenheip in recent years. Howard and his team and Ecoquest students conduct research at the reserve intended to aid in the species’ conservation. 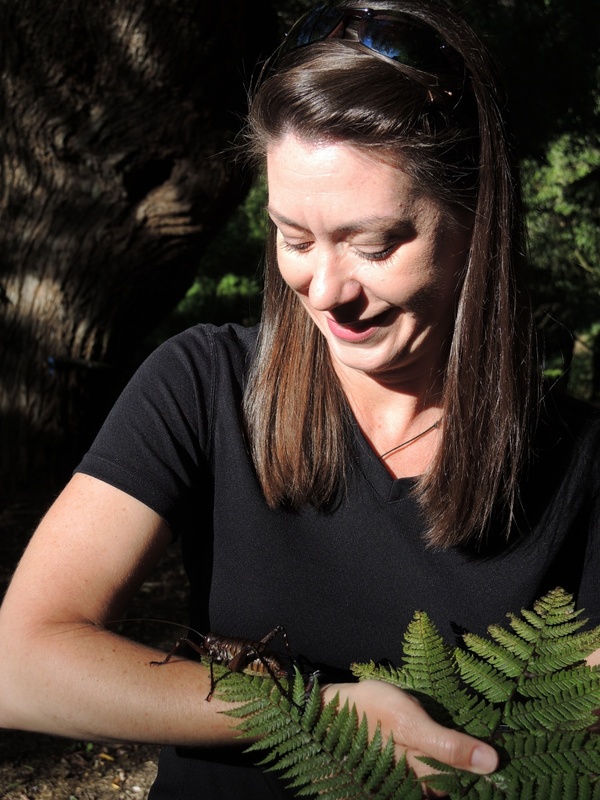 In addition to the Mahoenui and Cook Strait giant weta, Howard is also studying whether other giant weta species use substrate-borne vibrational signaling, and if the way they communicate has been influenced by their often harsh environments — a pattern evolutionary biologists call ecological speciation. According to Howard, it isn’t the size of these remarkable insects that makes them worth studying and conserving. This research is supported by funding from the National Science Foundation and the Orthopterists Society.